The Parrinos have been on the move lately...in particular, we've moved from Hopkinsville, KY to Cleveland, OH. With our family in flux, I'm longing for some consistency. 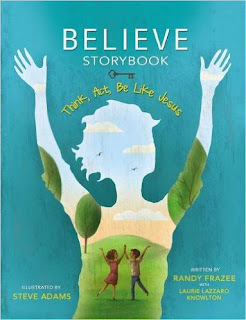 Just before we moved, I began reading the Believe Storybook: Think Act Be Like Jesus, written by Randy Frazee and illustrated in a rich, evocative style by Steve Adams. Unlike most of the children's bibles in our collection, this is a weighty book. A hefty 256 pages measuring 9 x 11 inches, and 2.8 pounds, the Believe Storybook is arranged into three 10-chapter sections: Think, Act and Be. Each chapter teaches a particular theme using one old and one new testament story. According to the cover, this devotional, based on the popular Believe series of devotionals, is geared for ages 4 and up. I have a 4-year-old, but he only sat next to his big brother and I for about 30 seconds before scampering off to grab another book off the shelf. My oldest son (nearly 7) enjoyed it enough that I think it will become our anchor for a consistent devotional time. My firstborn is a natural thinker, and the first chapter, "God," which discusses the three Persons of the Trinity using Genesis 1 and Jesus' baptism in Luke 3, really had my son thinking. I appreciated the way Frazee described the Triune God as a loving daddy, as Jesus and as an invisible wind, "whispering in your heart" (12). I was happy that the stories and illustrations held his attention even though the action in the stories weren't the typical plots to hold a little boy's attention like giants, lions' dens or seas parting. However, parents should not expect every question to be answered for them. When it came to reading about John baptizing Jesus, my son was full of questions, "Why did Jesus need to be baptised? He doesn't have any sin!" The finally portion of the chapter "The Jesus Answer" instead prompts kids to consider how the three persons of the trinity are apparent in the stories. We also read chapter 15 "Total Surrender," which used the story of Shadrach, Meshach and Abednego and the story of Stephen's martyrdom. Though Stephen's story has a "happy" ending of sorts, it's difficult to explain to my son why God allowed Stephen to die when He spared the trio of friends from the fiery furnace. "The Jesus Answer" section expounds on the story by trying to connect Stephen's sacrifice to readers' lives, asking: "So how can you sacrifice? How can you live your life so that you do what God wants, instead of what you want?" I didn't think that such a dramatic story, a gospel message that resulted in death by stoning, made a very good bridge to the question posed to children aged 4 and up. I do, of course, hope and pray all my boys would love God and dedicate themselves fully to Him. But I found this chapter challenging to discuss with my Stephen. Still, I recommend this devotional for parents looking for material that prompts deeper discussion. Parents should be comfortable answering some pretty heady theological questions though! Additionally, if you're like me, you might find yourself paraphrasing some of the language in devotional excerpts to tailor it for your children's comprehension level, maturity or attention span. It would make a good long-term devotional, as each chapter could be enough material for week.